Renaissance Pebble Creek is a 225-unit, 24-hour assisted living community located in Goodyear, Ari. The 9-acre site features a three-story building with 193 one-bedroom and 32 two-bedroom assisted living units. The facility also features activity centers, a salon, and dining, chapel and gathering areas. B&R Eng. was charged with creating the civil engineering plans for the site, including developing a storm water management plan. The initial plan was for runoff to be captured via a corrugated metal pipe (CMP) retention system and infiltrated using a drywell. However, the city of Goodyear recently began requiring the pretreatment of retained storm water prior to discharge into drywells to protect water quality. To meet the pretreatment requirement, engineers focused on hydrodynamic separation technology. 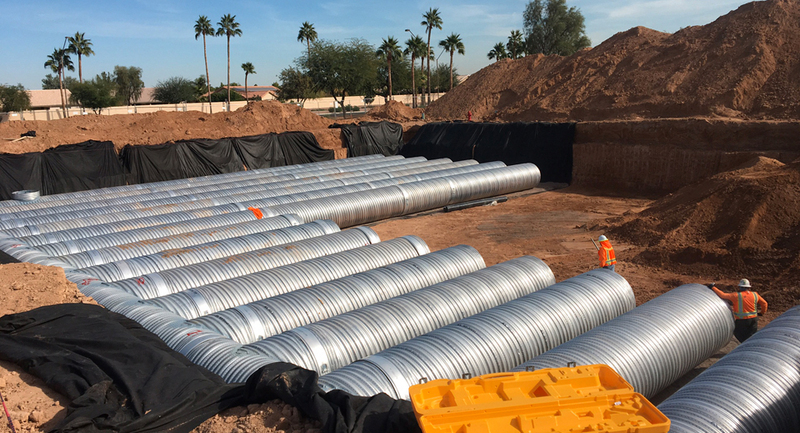 This is a new technology to some of the engineers and contractors in the area, so design and installation support were very important to ensure the products were properly chosen, appropriately specified and correctly installed to meet the city of Goodyear’s intention of pretreatment. After evaluating all their options, engineers chose the CDS hydrodynamic separator to provide pretreatment for this project. The CDS uses swirl concentration and continuous deflective separation to screen, separate and trap trash, debris, sediment and hydrocarbons from storm water runoff. It is able to internally bypass flows from larger storm events and still achieve 100% capture of trash and debris while providing high level of total suspended solids removal. Contech also supplied the CMP used to construct the retention system—1,675 lineal ft of 60-in. perforated ALT2 CMP. A Contech field representative was on site to assist Site Utility Systems with the installation of the CDS. The precaster delivered the CDS, and the contractor had a crane pick the pieces to set them. The Contech representative installed the internal components of the CDS, as the unit was 96 in. in diameter. The installation went smoothly, taking only about four hours from start to finish.